Among the multitude of viewpoints regarding a “new level” of BIM aspirations, Bentley Systems's CEO Greg Bentley offer the perspective of a leading software provider dedicated to “sustaining infrastructure" on how and why the advantages at each BIM advancement can accumulate exponentially. For context, we conceptualize the many potential advances, in technology and workflow processes, as pushing out a frontier arrayed across two axes (Fig. 1). 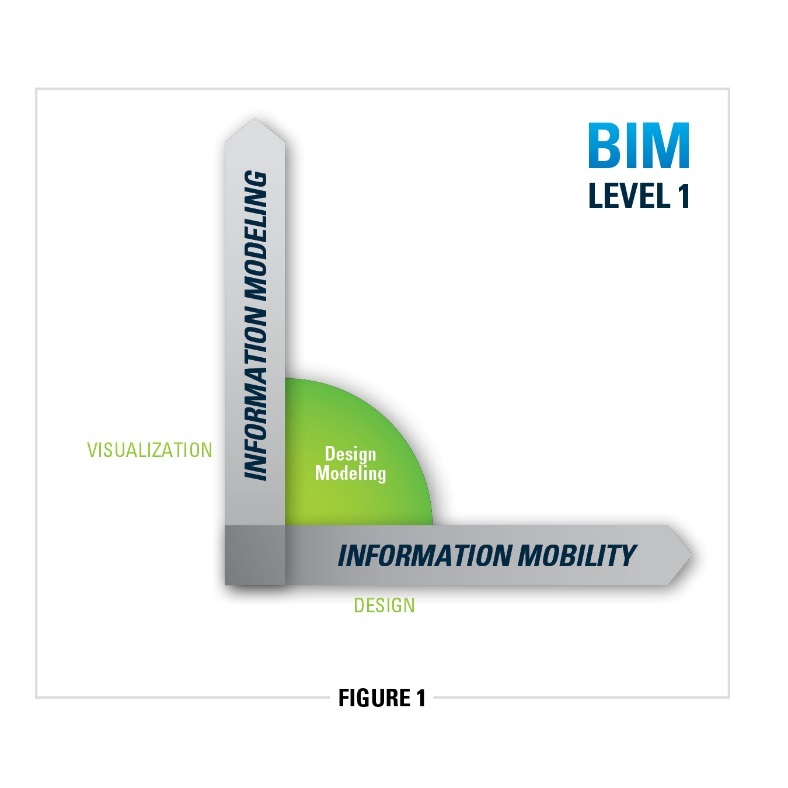 BIM strategies support better asset performance through increased depth of Information Modeling, while also enabling Better project performance through extended breadth of Information Mobility. For all of us, it is exciting to recognize the potential benefits of Level 3 BIM intelligence and immersion. But we can also anticipate that our cumulative advancements from BIM Level 1 and towards BIM Level 2 will thus pay off advantageously again, in sustaining infrastructure operations. BIM “Level 1” design modeling focuses on 3D visualization to consistently communicate and document designs, reducing errors. At Level 2, “optioneering” captures the potential of deeper information modeling to simulate a design’s performance, to the extent of assessing trade-offs across disciplines and systems, in terms of cost, time, efficiency, and constructability. In effect, the design is enriched by way of “analytical modeling,” which predicts asset performance—for example, anticipated operating pressures at various nodes in a piping network for potable water supply. 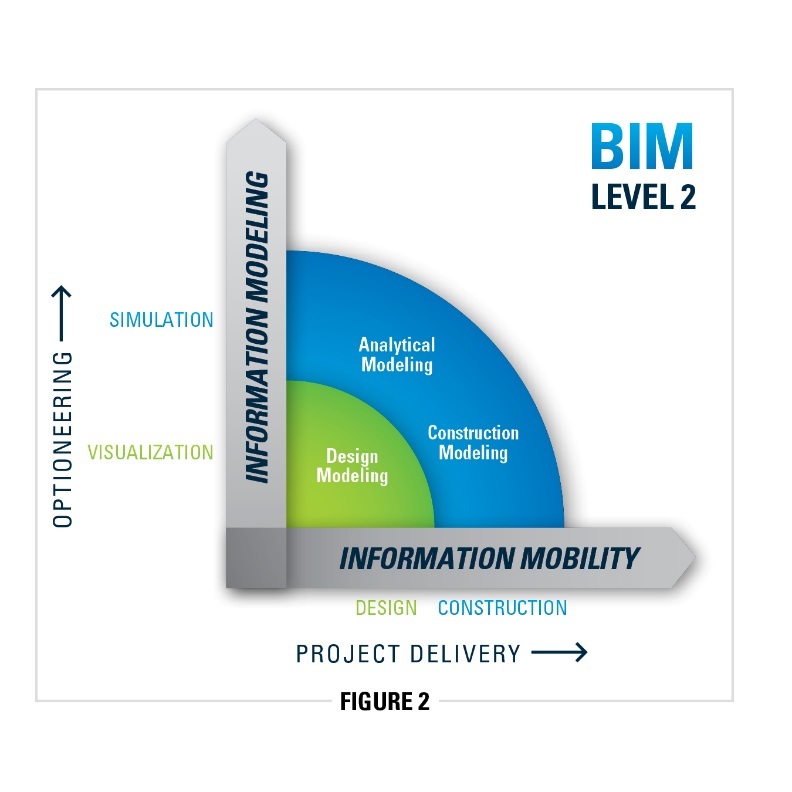 At the same time, Level 2 BIM advances enhance project delivery by broadening information mobility through construction—and throughout extended teams spanning procurement, fabrication, and sitework. For their purposes, “construction modeling” adds in temporary structures like scaffolding and formwork, and detailed construction specs and sequences not explicitly modeled in the design—including, for example, the as-built configuration of conduits, gas pipes, and reinforcing elements within a wall. In both Level 2 cases, it turns out that Level 1 design modeling contributes substantially toward optioneering and project delivery benefits (Fig. 2). By accomplishing analytical modeling and construction modeling through “overlays” referencing (but preserving!) the design decisions, errors are further minimized, and performance improved. As important as these advancements are in their own right, we can look forward to a greater magnitude of BIM returns—the aspiration for “Level 3” performance during infrastructure’s operations lifecycle, after construction has realized the physical asset. In this Level 3 vision, assets and their components are networked and connected within their physical environment, providing feedback for operational controls, maintenance, and safety. In effect, beyond visualization and simulation, Level 3 information modeling supports “reaction”: enabling continuous real-time decisions for best performance. The infrastructure asset, connected through real-time sensors to an “information-modeled” counterpart, can operate with intelligence. These link the accumulated information modeling for an asset within its 3D real-world positioned context, making its intelligenceintuitivelyaccessible (Fig. 3). For real-time data streaming from embedded sensors in Level 3-connected infrastructure assets, Level 2’s analytical modeling provides the frame of reference needed to support actionable decisions. To start with, observed readings can be compared against the benchmark of Level 2 predicted readings—then the analytical models are permuted systematically until varying design parameters appear to fully account for the differences. This reveals the extent of as-built departures and/or as-operated deterioration with respect to the modeled design, which observed “design” parameters are in turn analytically modeled to continuously confirm reliability and safety margins. In the water network example, observed operating pressures, in conjunction with the attendant analytical modeling, yield as-operated “design parameters”—which, when compared with the actual design modeling, reveal the probable location, and effects, of accumulated corrosion. When this approach is used to expeditiously find and repair underground leaks, yielding savings in water and excavations, and minimizing disruptions, the return on design modeling and analytical modeling compound. Going beyond merely real-time monitoring, this reactive intelligence completes the reach for asset performance management. As important as these advancements are in their own right, we can look forward to a greater magnitude of BIM returns—the aspiration for “Level 3” performance during infrastructure’s operations lifecycle, after construction has realized the physical asset. Level 3 immersion, for literally “hands-on” access to design modeling and construction modeling intelligence, can even achieve breakthroughs in infrastructure asset safety and resilience. A first responder with a “wearable” display, for instance, could look “through” the positionally aligned and hypermodeled building wall to locate those as-built construction-modeled conduits and gas pipes. Not only would this timely reveal the immediate risks, but also the potential mitigation strategies—through hyperlinked safety procedures. With immersion, the lifecycle information accumulated and managed through BIM Levels 1, 2 and 3 can become lifesaving! 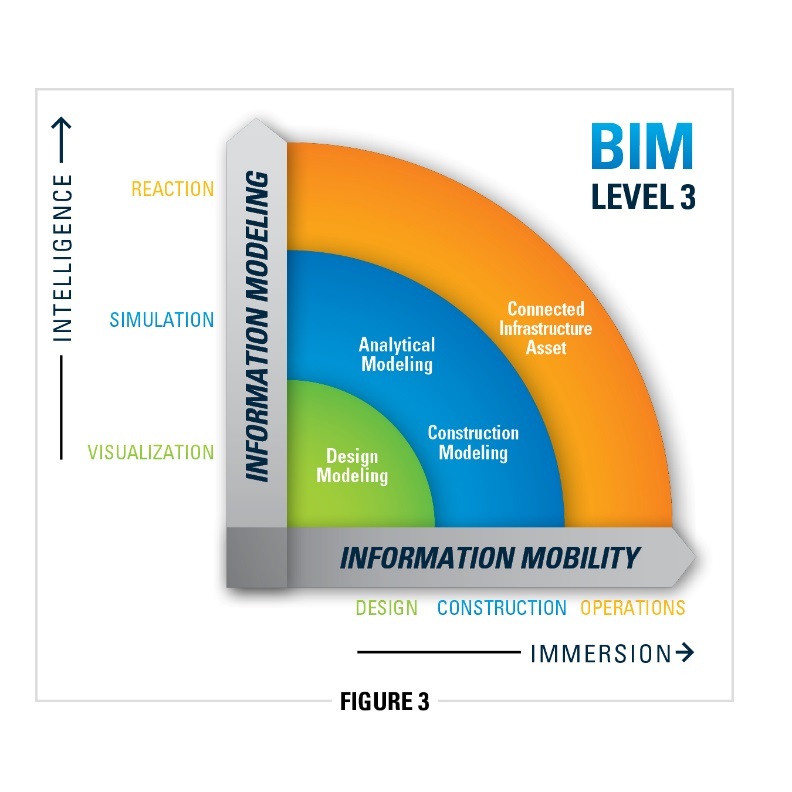 For all of us, it is exciting to recognize the potential benefits of Level 3 BIM intelligence and immersion. But we can also anticipate that our cumulative advancements from BIM Level 1 (design modeling) and towards BIM Level 2 (analytical modeling for optioneering and construction modeling for project delivery) will thus pay off advantageously again, in sustaining infrastructure operations.